With the EPA just over a week away from proposing America's first-ever national carbon pollution standards for power plants, the dirty air lobby is on the offensive. The National Mining Association is kicking off the attack with a radio ad that the Washington Post Fact Checker calls "bogus" and "hyped." Take Action: Demand that your radio station stop spreading these lies and deceptions. I am writing to bring to your attention a false, misleading and deceptive advertisement being run on your station by the National Mining Association. The central claim of the ad, an inaccurate and duplicitous statement about the impact of new clean air standards expected to be released by the EPA next month, has been determined to be false by independent researchers at The Washington Post. In an article published today, The Washington Post fact checker called the ad's claims "bogus," "hyped," and "wholly unsupported." They concluded that the ad does "not pass the laugh test." 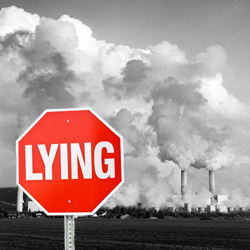 You can read the full text of the fact check here: http://www.washingtonpost.com/blogs/fact-checker/wp/2014/05/23/a-bogus-claim-that-electricity-prices-will-nearly-double-because-of-clean-coal-technology/ Accordingly, I am asking you to immediately cease airing this deceptive ad. As you know radio stations licensed by the Federal Communications Commission have legal obligations. The FCC states: "Broadcasters are responsible for selecting the broadcast material that airs on their stations, including advertisements. The FCC expects broadcasters to be responsible to the community they serve and act with reasonable care to ensure that advertisements aired on their stations are not false or misleading." Now that you have received credible information that the ad is false and misleading, I respectfully request that you immediately stop running this deceptive and duplicitous advertisement.